This isn’t our first visit at Stubby’s. The last time we tried their bloody beverage, TJ and I tried both offerings on the menu: The Rustico and the Classic (read the post here). It wasn’t until almost two years later, TJ was there with friends and they offered to “make his bloody spicy”. He came home ranting and raving about how great it was and that I needed to go back. Spice: In my last review, I noted that the Classic lacked a little spice but had great flavor. Well, Stubby’s redeemed itself. For the “spicy” version, they use pepper-infused vodka and it is such a good complement. It still has the smoky and full flavor that I liked the first time but amplified by the spice. I’m not sure if Stubby’s infuses their own vodka or if they are using a Absolut-Pepper sort of thing – yet to be determined I suppose. Since TJ liked the bloody mary, I know it fits within the scale of being “too spicy” and still having great flavor. The consistency is perfect too. 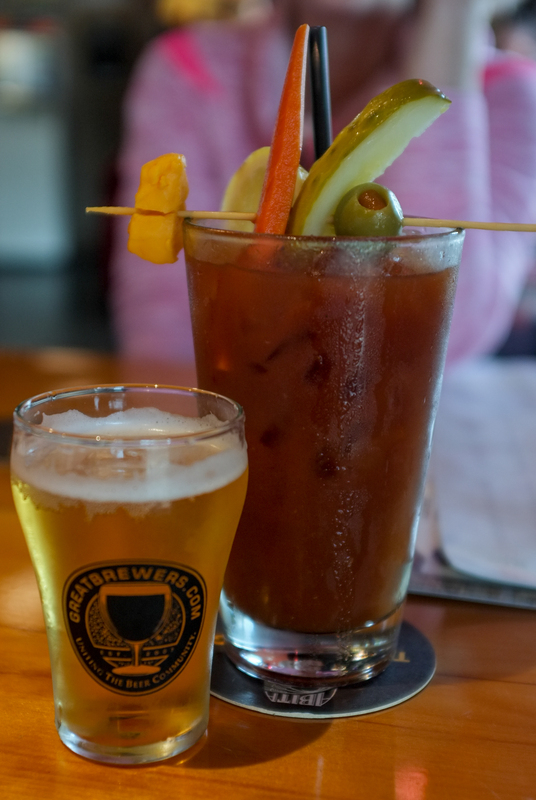 Garnish: Stubby’s topped this Bloody Mary with a carrot stick, pickle, green olive, small cheese curd, lemon and lime. No fooling around, you guys. Straight to Bloody business. Chaser: Just like last time, I didn’t catch which beer was offered. However, it was included and it was beer. So it was nice. Buzz: Don’t go here looking for a buzz. Being our second time with the same results, I feel confident saying it wasn’t just me. Size: This was served in a 16 ounce bar glass. Final decision: The last time we were here, I wasn’t that impressed. I wanted to really like them because we like Stubby’s. They have a great location and beer selection. The spicy option for the Bloody Mary redeemed itself for me. While I wouldn’t have ordered it again last time, I absolutely would now. Go try one! This entry was posted on December 7, 2014 by Shannon in Bloody Marys in the area and tagged best bloody mary in milwaukee, Bloody Mary in Milwaukee, bloody with cheese, good bloody mary, Infused Bloody Mary, Milwaukee, Milwaukee Bloody Mary, pepper infused bloody mary, spicy bloody mary, Stubby's, Stubby's Pub & Grub.